One of the major problems with earlier version of Microsoft Windows was that a user had to apply a number of security templates, tweaks, registry edits, etc. to bring it to a safe state. Now, Microsoft delivers a secure out of the box product, Windows 7. Microsoft Windows 7 comes with built-in security features to make the product highly secure and usable, depending on what the user requires, without the need to apply any sort of templates or patches. BitLocker is a driver encryption utility that allows you to encrypt any drive, including boot sector, system area, or any other removable devices like USB drives. In windows explorer, right click the drive you want to encrypt and BitLocker will provide you a combination of security measures like PIN, smart card, password and TMP (Trusted Platform Module) chip to encrypt the drive. It supports all types of volumes like FAT, FAT32, NTFS and Extended Fat. However, you should be cautious while using BitLocker because if you forget the password, BitLocker will scramble your device. It’s better to backup your data in some other media before encrypting the drive. Windows Vista must be familiar with UAC (User Account Control) setting that was the most annoying part of Vista, where one has to grant permission for every accessed program. 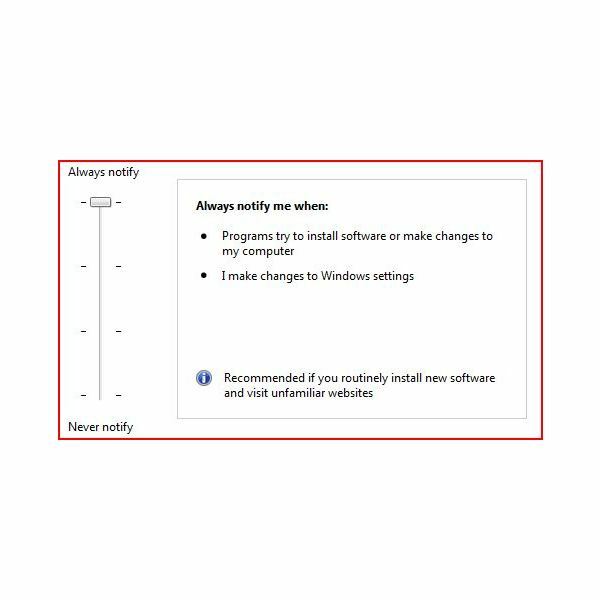 In Windows 7, a new UAC slider has been introduced to control the level of security. Raise the bar to increase the security, and it will always notify you if the program runs and lower the bar to reduce the security and you will never be notified. The best part is that even in the highest security mode, you will be notified fewer times in comparison to Windows Vista. By default, Microsoft Windows 7 allows for critical updates only. According to a study, Microsoft releases too many patches for its software. Therefore, you should manually configure the settings to allow for all updates as hackers usually attack systems that are more vulnerable to attacks. The biggest threat to Microsoft Windows is the Trojan horse that fakes to look like Outlook Express, movie codecs, videos, etc. A Trojan horse takes control of the PC by installing malware and other malicious code on the system without the user’s permission. This is done to steal important information and send it back to the intruder. To get rid of such crap, you need to install anti-malware and anti-spam software’s that are genuine and reliable. You should always download such software’s from a trusted website. Microsoft has introduced a complete new version of internet explorer that seems to be smarter than earlier versions. It comes preloaded with set of features like SmartScreen filter or Private Filtering to keep the internet experience safe and secure. The smartscreen feature checks every website against a database to make sure that the website being surfed has earlier been marked as malicious or legitimate. Internet explorer 8 users must enable this option to make their browsing safe and secure.